I’ve been a major fan of the DD-WRT project for almost 6 years now. I first stumbled across the project back in 2006 right after I bought a Linksys WRTSL54GS, a router which was notoriously overpowered and underpriced. After an easy trip to Best Buy and a quick download of DD-WRT, one could turn their $60 consumer-grade router into a $600 piece of professional-grade routing equipment. Much has changed since then (hardware is far more powerful now than it was back then), but yet, some things have remained the same. DD-WRT, for example, is still the best open source firmware for any router out there, hands down. I installed it once in 2006, again in 2009, and having just flashed my 3rd router now in 2011, I can’t tell you how much it pleases me to know that DD-WRT is not only alive and well, but still King of the Open Source Router Firmware Hill. If you’re wondering why anyone would want to change their stock firmware, I can only say that installing DD-WRT gives you a far greater degree of control over your network and many more ways to make sure that it’s running at it’s fullest potential. I’ve tried describing the benefits of running DD-WRT before, but have always difficulty with it. I think the best way to describe it is that it’s hard to know what you’re missing until you see it. If your networking needs are straightforward, and your usage is simple, you may do well to keep your router’s stock firmware where it is. But if you frequently video chat, play games, continuously transfer large amounts of data, get poor wireless reception, or do anything outside the ordinary “surf the web” profile, it’s likely you’ll see benefits from installing DD-WRT. I particularly enjoy playing around with the Quality of Service controls as well as adjusting the transmission power of my wireless antenna, but these are just 2 of nearly 75 different useful features not commonly found on consumer-grade routers. For a good overview of everything DD-WRT has to offer, I suggest reading through the DD-WRT Wiki, especially their explanatory page What Is DD-WRT?. If you think installing DD-WRT on your router is something you’re interested in, and you’re in the market for a new router, I recommend checking out the Netgear WNDR3700-100NAS. It’s well supported by DD-WRT, very popular with many of it’s users, and is currently (October 2011) the best router on the market in both the price and performance categories. What’s important to note is that the first hardware revision, the WNDR3700v1, has 8 MB of Flash and the second hardware revision, the WNDR3700v2, has 16 MB of Flash. While DD-WRT only needs 2 MB of Flash for a bare-bones installation, the more Flash you have available, the more features you’ll be able to install. A complete installation of DD-WRT usually hovers around 7.5-8.5 MB depending on the release, so I’d recommend getting the WNDR3700v2 and it’s spacious 16MB of Flash just to make sure you never run out of room. Usually, this is where the hard part would begin: with other router manufacturers, finding the right hardware revision (in our case, revision 2) would be an exercise in extreme patience and several attempts to the store since few manufacturers clearly label their devices with anything but a manufacturing date and serial number. With this information in mind, feel free to go out and buy a Netgear WNDR3700v2-100NAS. Once you get the right hardware revision, you’re ready to begin the installation process. Unpack your router and flip it over so that you have a clear view of its underside. You should see a fairly large label describing the various ports on your router. Ignore all of this. What you’re interested in is the version number. 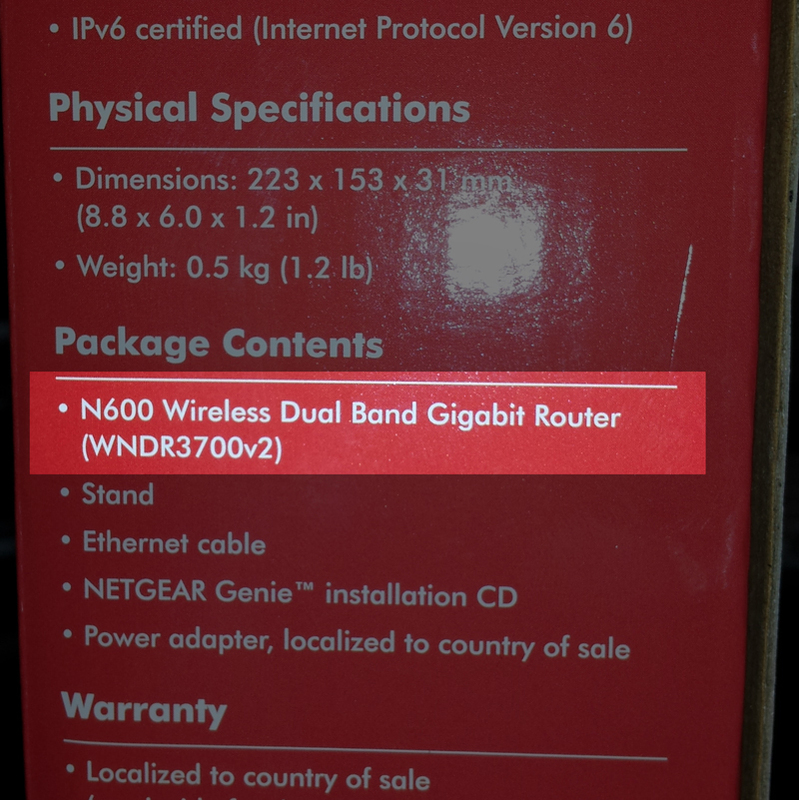 Under the large “NETGEAR” brand name, you should see some smaller text that says “N600 Wireless Dual Band Gigabit Router” followed by the model number and revision. 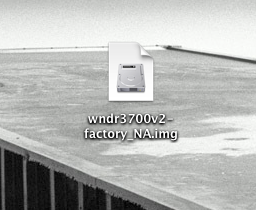 If the label says “WNDR3700″ or “WNDR3700v1″, you have the first hardware revision of the WNDR3700-100NAS. This is not the one you want. If the label says WNDR3700v2, you have the second hardware revision of the WNDR3700-100NAS. This is the one you want. Once you’ve confirmed that you have the right hardware, you’re ready to download the DD-WRT firmware. You’ll have to perform the actual flashing of your router with a computer that’s been disconnected from the internet. This means that you’ll need to download the firmware ahead of time. The DD-WRT Wiki contains a handy guide written specifically for the WNDR3700, but it’s since been outdated, so we’ll only be using it as a reference. Once you’ve downloaded the appropriate firmware for your location, unplug your computer from the internet and connect it to one of the LAN ports on the WNDR3700. Power up the WNDR3700 and let it sit for a minute and assign your computer an IP address. Note: It’s important that you connect to the router over one of the ethernet LAN ports, and not the WAN port or the wireless connection. Once you’ve connected your computer and router, open your browser and go to the IP address 192.168.1.1. You’ll be presented with a login screen for the router. The default username is admin and the default password is password. 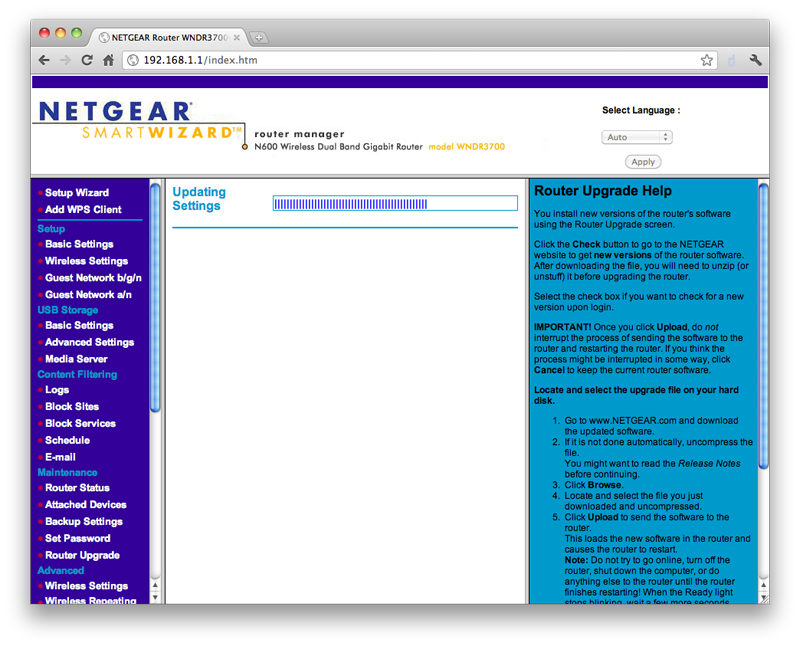 In the lower left hand corner, under the “Maintenance” section, you should see a link that says “Router Upgrade”. Click that link. 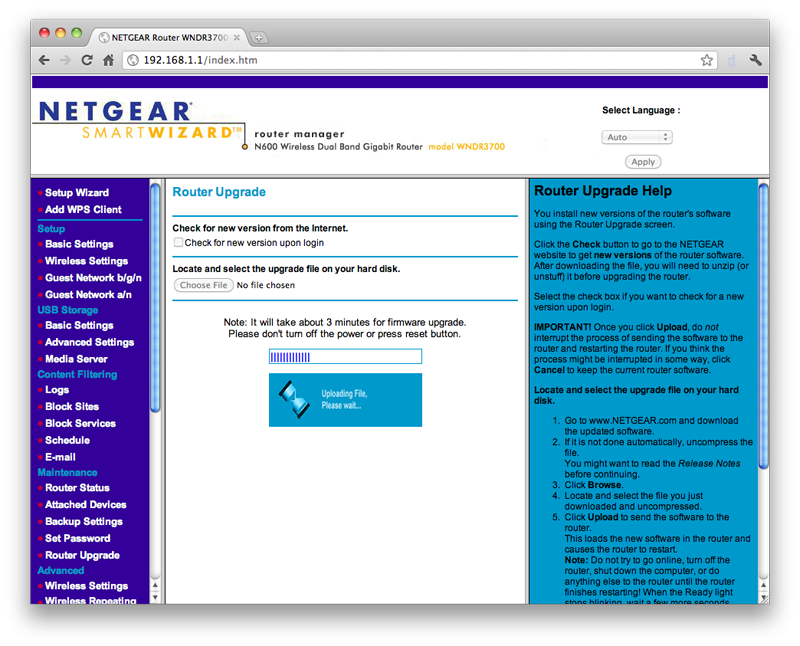 You will then be brought to the Router Upgrade page. Click the “Choose File” button and select the firmware you just downloaded. Click Upload. A progress bar should appear with a message stating “Note: It will take about 3 minutes for firmware upgrade. Please don’t turn off the power or press reset button”. You’d do well to heed this warning: if the connection between your computer and your router is interrupted for any reason (loss of power, cable becomes unplugged, browser window is closed) at this stage, it will likely semi-brick your device. I say “semi-brick” because it won’t permanently damage your hardware, but it will require more effort to recover the device back into a working state and you’ll have to start over. 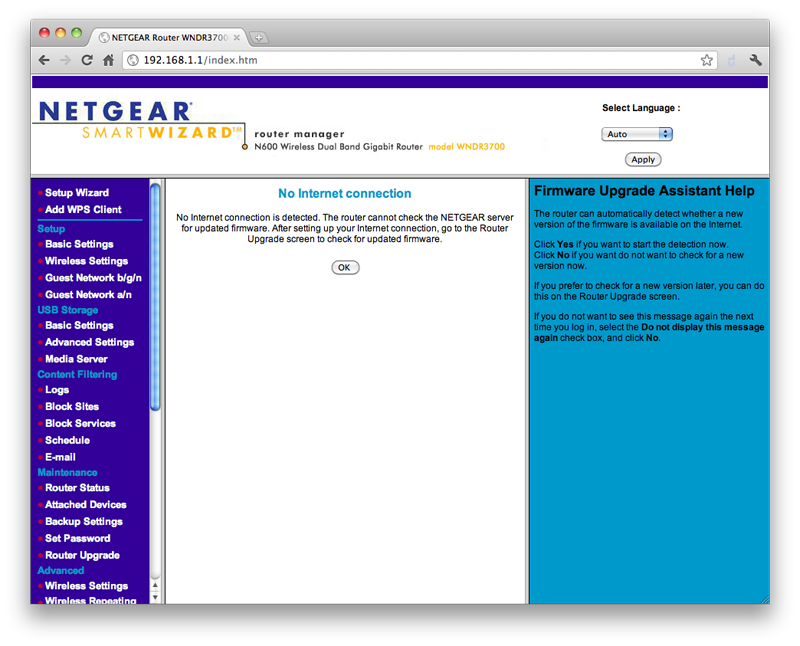 Consult the DD-WRT Wiki guide for the Netgear WNDR3700 if something goes wrong. After the upload completes, the router will then begin installing the new firmware. A new progress bar should appear, and should slowly inch it’s way across the screen over the next few minutes. When it reaches 100%, the browser will refresh, and Netgear’s interface will be replaced by the default DD-WRT change password screen. I know it might be tempting, but do not change your password yet. Let the device sit for 2 minutes to ensure that the router’s had a chance to finish installing everything. Once 2 minutes are up, create a username and password for your new DD-WRT installation. This will be the username and password you use to log in to the router from 192.168.1.1. If you forget these values, you can reset the router’s firmware (which is now DD-WRT) to its default values by using the 30/30/30 Method as documented in the DD-WRT Wiki. Note: Pushing the reset button on your newly unlocked router will NOT wipe the DD-WRT firmware from the device, so don’t worry. It will instead only reset DD-WRT to its default values. Congratulations! You’ve successfully installed DD-WRT on your router and are now ready to begin exploring some of the features your new firmware has to offer! Good luck and have fun!